Currently, the construction of the new Facebook data center is underway in Odense, Denmark. This data center will be one of the most advanced and energy-efficient buildings of its kind. The Dutch construction company TSV is participating in this project and using VIAVAC’s vacuum lifters. For the construction of the enormous roof of the Facebook data center, several parties are using a variety of VIAVAC’s vacuum lifters. Specifically for this project, TSV purchased two new CladBoy CB4s, which are being used to install steel roof panels in this building. Facebook’s decision to build the center in Odense was made because of the favorable climate. The company will save money on air-conditioning that would otherwise have wasted energy. With a surface area of 56,000 square meters, this is Facebook’s third data center outside the US. The servers in the data center will store pictures, videos and other information. The CladBoy CB4 is used in this project. The new CladMaster was successfully deployed at the Geusselt stadium in the Dutch town of Maastricht. Kempen Cladding hired this vacuum lifter and installed sandwich panels with a core material of stone wool on the underside of the grandstand. The MVV Maastricht football stadium was extended with a sports hall, for which a part of the space below the grandstand was used. To apply insulation to this space, approximately 300 insulation panels weighing 200 kilograms each were installed at an angle of 36° and up to a height of 14 meters on the underside of the grandstand. The CladMaster is most convenient for this type of job; installed using a forklift, the panels can be transported and installed in an efficient and safe way. Thanks to six hydraulically powered movements, the panels can be placed with millimeter-level accuracy. The movements can be proportionally operated at two speeds by radiographic remote control. Thanks to the VIAVAC CladMaster, this job was finished on schedule and executed in compliance with all health and safety standards. The CladMaster is used in this project. The roof of an existing warehouse was replaced and expanded at the same time. The old roofing was replaced by sandwich roof panels, after which the enlarged area was equipped with solar panels. This was all carried out using the CladBoy CB5. Using 21-meter-long panels, we were able to span the entire roof construction and did not need to adjust the existing supporting structure. Because the vacuum lifter has suction pads in several locations, the sandwich panels will not bend during lifting. Using the CladBoy CB5 with dual-vacuum technique, additional safety straps are no longer a requirement. The installation of more than 1,200 m2 of roof panels was carried out by the construction company Lont. The mechanics using the VIAVAC vacuum lifter were very pleased with its convenience and speed. In the middle of Moscow’s business center stands Europe’s highest skyscraper, the Federation Tower. During construction, the VIAVAC compact GB-750 was used to install glass panels. The construction of the 373.7-meter, ninety-five-floor tower, was completed in 2016. Assembling the glass roof construction of the upper floors was particularly daunting, as the highly experienced specialized assembly team was faced with high winds, snow and temperatures down to −20° C, as well as the complicated positioning of the glass. The roof construction’s glass elements were installed with the help of the VIAVAC compact GB-750. In order to accomplish this, the tilting function of the vacuum lifter was used to place the glass in the correct position. The VIAVAC compact GB-750 is used in this project. A considerable effort is currently under way to renovate the famous Atrium office building in Amsterdam. In addition to the renovation of the current premises, two further towers are being built to expand the office complex. In order to alternate between workplaces and light, open spaces, the company Octatube from Delft is integrating seven winter gardens into in the corners of the towers. The corners of the winter gardens consist of large, warm, curved glass elements. Octatube hired the VIAVAC compact Curved glass lifter to install these elements. This machine is designed specifically for placing curved glass elements, and can be adjusted to accommodate different radii. In addition, with the VIAVAC compact Curved, the elements can easily be rotated (360°) and tilted (90°) from their transport position. For this project, Octatube is also using the VIAVAC GBX for the installation of flat glass elements. This glass lifter is suitable for lifting elements up to a weight of 800 kilograms. Both glass lifters feature two independent vacuum circuits, eliminating the need for safety straps and allowing efficient operation. In addition to the option to rent, VIAVAC also offers the vacuum lifting tools for sale. The VIAVAC compact Curved is used in this project. In 2016, a lot of hard work was put into building Denmark’s largest stadium, the Royal Arena, a multi-functional indoor stadium in the Ørestad South urban area of Copenhagen. 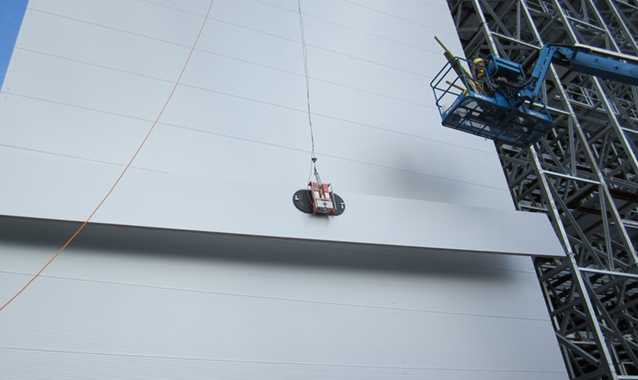 VIAVAC supplied Danish company HS Hansen with the CladBoy compact GB-750 vacuum lifter to assemble the sandwich cladding panels. The vacuum lifter is suitable for lifting panels up to a weight of 750 kilograms, is very compact and easy to transport, and efficiently handles a variety of assembly jobs. The arena meets the highest international standards with respect to comfort, acoustics and functionality. The Arena opened in early 2017 and has a capacity of 12,500 spectators for sporting events and up to 16,000 for concerts. The CladBoy compact GB-750 is used in this project. For the installation of sandwich roof and wall panels of the cold store building, different VIAVAC vacuum lifters were used. CladBoy CB4 was used for the roofing, and CladBoy compact for the wall panels. The installation work was done by KIM Nederland, leading specialist in modular insulated construction. The cold store is composed of a 40 m high steel structure with sandwich panels for the roof. The façade has a thickness of 20 cm and panels up to a length of 19 m.
For this project, very strict requirements were set concerning safety on the construction site and the working conditions for the employees. The use of VIAVAC vacuum lifters, among other things, made it possible to install the very long and heavy sandwich panels in a safe and efficient way. The cold store has more than 21,000 pallet places and a fully automated logistics throughput system at an operating temperature of -17 degrees. For the further expansion of a production hall in Germany, the company Brüninghoff GmbH has installed sandwich rock wool-based roofing panels with a length of 22 meters for the company Friedrich Hippe, by making use of the CladBoy CB5 vacuum lifter. Because of the length of the panels, this vacuum lifter is equipped with a dual vacuum system, suction cups in between and it has a chain suspension. The chain suspension ensures that the panel stays straight and does not bend, which prevents the panels from being damaged. With the aid of the vacuum lifter, panels can be installed by employees with minimal effort in a quick and safe way. With the CladBoy CB5, it is even possible to install panels up to a length of 25 meters.